One down, two to go. Next up is Switzerland v France. The former is the higher-ranked team, btw. 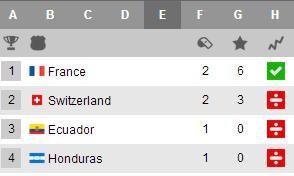 But France sit top of the table on goal difference. Will the men in blue suffer a similar fate to another set of men in blue just a while ago? We'll find out soon. France have the early goal. One that they needed. One that they wanted. It's Giroud. Swinging corner, Giroud jumps the highest. Top right corner of the goal. What happened there? Usually, it's an equaliser that follows. But France have doubled the lead. Switzerland shell-shocked! France looking good for the win. Defensive error and Matuidi squeezes that in. Could've been 3-0 for France but Benzema's penalty is saved. Still just the two goals in it then. It was coming. It has come. France's third goal. Are they in the mood today or what! Some attacking football from France and that is fully rewarded. No way back for Switzerland I guess. What a tame, tame goal for Switzerland. They'll take it. Who has got holes in the defence now, eh? Free-kick to the Swiss, rolled it along the floor. Through the wall. Back of the net. Consolation. A hammering. A five-star hammering. France are through. The Swiss will need to wait. Real contenders now. A little comeback hint by Switzerland in the last 10 minutes but it was too late. France were just far superior. So there's one more game tonight: Honduras v Ecuador. Both sides without a point in the 2014 World Cup and I can bet all my savings that it will change tonight! Honduras: Valladares, Beckeles, Bernardez, Figueroa, Izaguirre, Oscar Garcia, Garrido, Claros, Espinoza, Bengtson, Costly. Ecuador: Dominguez, Paredes, Guagua, Erazo, Walter Ayovi, Antonio Valencia, Minda, Noboa, Montero, Caicedo, Enner Valencia. We didn't have a goal for 30 minutes. Now we have two in three minutes. 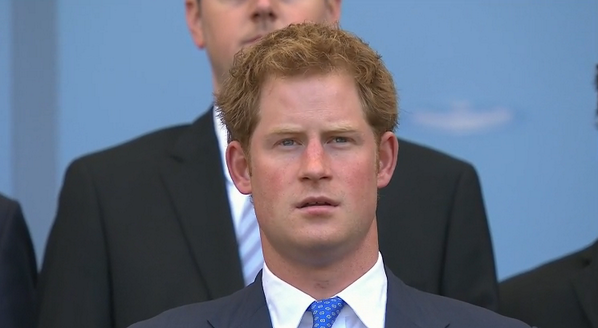 Ecuador equalise. Lapse in defence where Honduras men were ball watching. 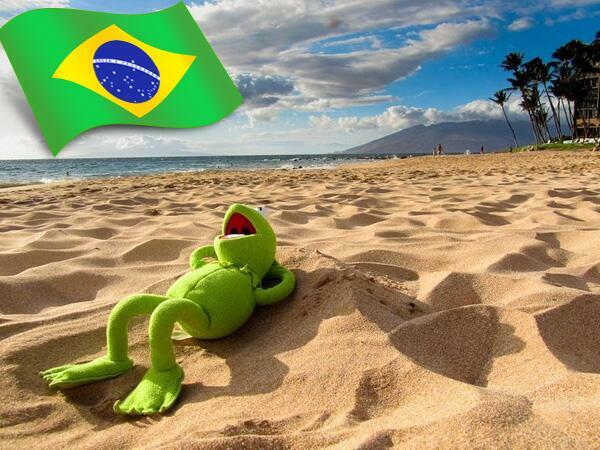 And back of the net for Brazuca once again. How many times in this World Cup have we seen instant equalisers! I've lost count. 1982 - Carlo Costly has scored #HON's first World Cup goal since 21st June 1982 (v Northern Ireland). Wait. Goal? No goal. Yellow card instead. Honduras were celebrating but the ref had other ideas. 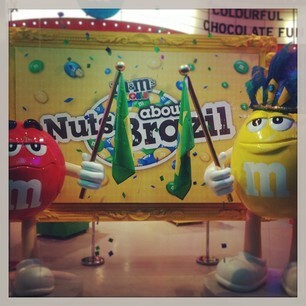 Today is all about m & m's. Messi and Muller will both be on show and are set to light-up proceedings as they chase the Golden Boot award with Benzema. Germany and Argentina playing today. Messi and Müller, perfect. 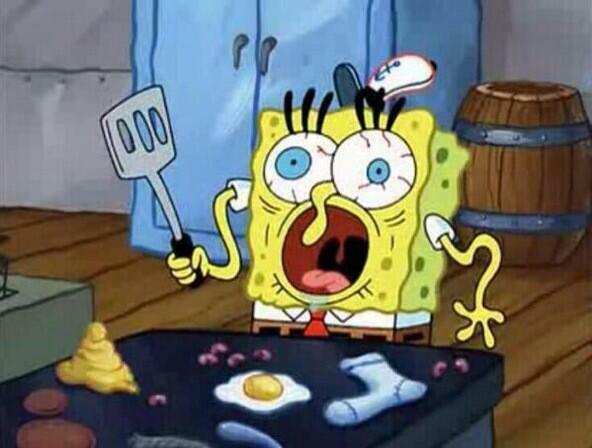 Five minutes left. Which way is this game going? Where is it going? How is this going to end? Germany? Ghana? A draw? Anything is possible! You feeling this?? I am! The ref has blown the whistle but I don't want it to stop. The players have stopped though. What a game we've had. Germany had the lead. Ghana equalised and went 2-1 up. Klose brought it back to 2-2. And that was that. Brilliant, brilliant display of football. Goal? No, offside given against Dzeko. Let-off for Nigeria. Poor decisions are back. And I thought it was a thing of the past. Still goalless then. Nigeria ahead! This Nigeria is nothing like the one that took on Iran. Good run from the right and the ball is swept past the diving keeper by Odemwingie. As things stands, BiH are heading home. But things could change dramatically. We've seen that before. Let's hope there's more action. Players go down the tunnel for a deserved break. Who are you backing then? Well, that's it for tonight folks - what breathless display of football we've had today. As a re-cap, Belgium left it late to beat Russia 1-0 in Group H, Algeria won a six-goal thriller 4-2 against South Korea to keep their chances of qualification to the last-16 alive and Portugal scored in the final minute of extra time to claim a dramatic 2-2 draw with USA. Tomorrow we have four more fixtures and a load of goals coming your way with Australia V Spain, Netherlands V Chile, Cameroon V Brazil and Croatia V Mexico. Join us then and good night from the Al Jazeea Sport newsdesk! Some disgruntled Spain fans getting nostalgic watching their team dominate the Aussies. Some more convinced of this showing than others. Its a shame to see Spain so well again. David Vila with a top draw goal against Australia. Ruined their position to accommodate a Costa. David Villa has his goal, and his night is done. Juan Mata comes on as the Spanish look to seal the game off. A fitting end for Villa's international career as he embarks on a new journey in America. 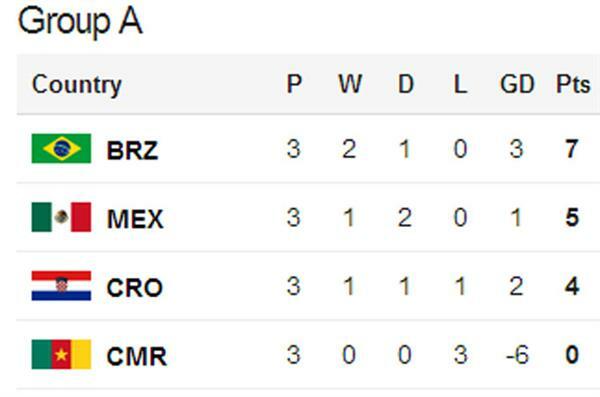 As it stands at half-time this is what Group A looks like. Brazil v Chile in the first round of the kock-out phase would be a very tasty match. Mexico happy to park the bus on defence and keep a point advantage over Croatia, so we need the Europeans to score and bring Mexico out of their shell a bit. Hi Fred! The striker has finally arrived in Brazi as he heads in from point-blank range after he is picked out by David Luiz's swooping cross. Was Fred offside though? Looks a long way off line-judge. Maybe the official was distracted by Fred's new mustache. 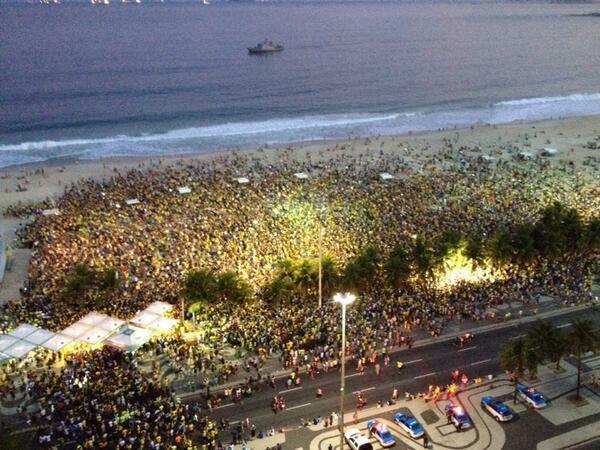 Now it's Samba time in Brazil! Well folks, that's it for this evening - another night of drama, another night of goals. In terms of action on the pitch, this has to be one of the most exciting World Cups ever - and we haven't even reached the knock-outs yet! In a dead-rubber Spain defeated Australia 3-0, the Netherlands topped Group B with a tactical 2-0 win over Chile, Mexico knocked-out Croatia with a 3-0 victory and hosts Brazil thumped Cameroon 4-1 to win Group A.
Brazil will play Chile next and Netherlands will take on Mexico. I'm already breathless just thinking about it! Massive evening of football and we have lift-off! Italy V Uruguay and England V Costa Rica have just kicked-off. Can't really work out if this is and England fan or not? 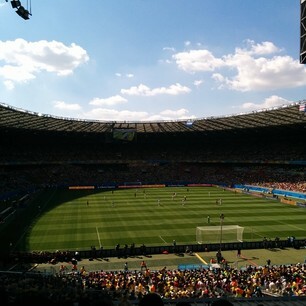 #ENG vs #CRC Come on England, go out in style. The support you have is amazing. Almost the perfect start for Costa Rica! Arsenal forward Joel Campbell hits a shot into the back of Gary Cahill, it loops over the head of Ben Foster and bounces just past the far post. Little action in either penalty area but plenty of free kicks already. 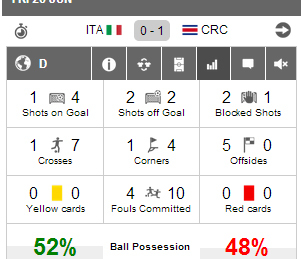 Mexican referee Marco Rodriguez is certainly going to earn his money in this game. Luis Suarez is on the receiving end of a heavy Italian challenge before committing a foul himself. Italy only need a draw to reach the last 16 at the Estadio das Dunas in Natal. Suns out - let''s see some flair! Sturridge has come to play, or at the very least go out in a blaze of glory. Smashed it from 20 yards without a prior touch, keeper has no chance but it's just past the post. This is quite funny, but also a little scary. 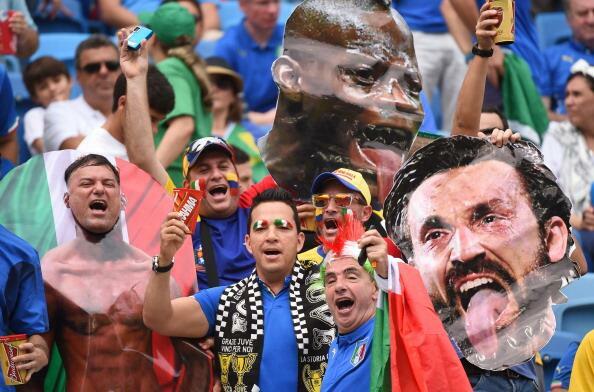 Italy's fans always have a presence. The green, white and red eyebrows are a particularly fetching touch. 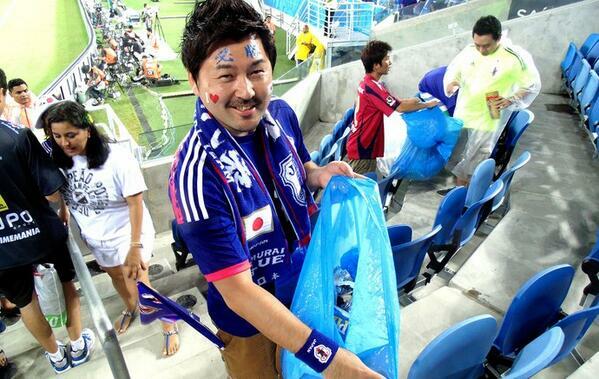 Did you know at their last game, Japanese fans helped clean the stadium afterwards? Brazil has the second largest concentration of Japanese outside of the country itself. Maybe they felt it their national duty. Whatever the case, it's a great example for the rest of us. 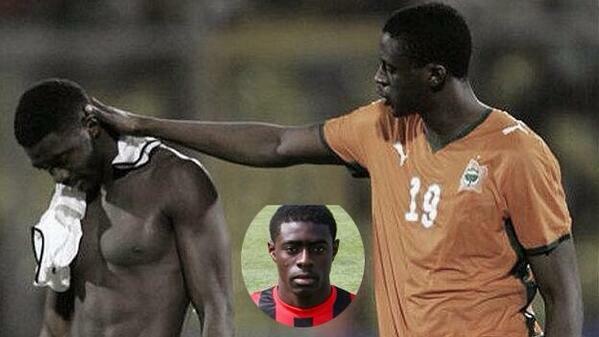 The Toure brothers are today playing for their brother Ibrahim, who died of cancer this week. The Ivory Coast players are wearing black armbands as they play in his memory. A place in the knockout phase would be a fitting tribute. "@Qué difícil debe ser para los Touré (Kolo y Yaya) jugar y estar en Brasil sabiendo que su hermano Ibrahim murió: http://t.co/4vlEuMcItR"
The Fortaleza is a fantastic setting for this game. Drogba gets the ball in the centre circle and charges towards the Greece box, passes to Gervinho but the Roma man gets caught-up in defenders and the move comes to an end with a clearance. The South Americans, as with just about every other game in this tournament, have had the better of their opposition in the early exchanges and look the more eager on the ball. 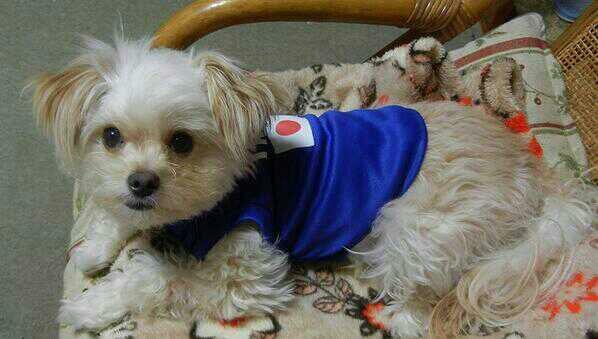 Not a typical Japanese name, but fair play Patrick, wear those colours with pride. Today's furry fan. Columbia wrap up a comprehensive win in style as the excellent James Rodriguez sprints down the left, turns Maya Yoshida inside out and fires home. Job done. 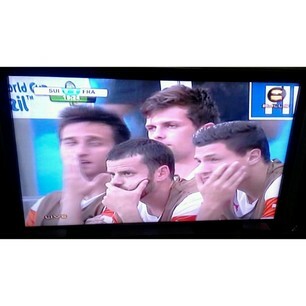 Total drama and total heart-ache for the Africans. Full-time has blown in both games and Georgios Samaras has had the last say for Greece as he smashes home the goal that sees his team progress to the last-16 of a World Cup for the first time in their history.